Despite the record-breaking high temperatures (who's complaining? ), Mrs. Abrams's Babaganoush class of 2nd and 3rd graders enjoyed accepting brand new dictionaries from the Club. All of the students showed their enthusiasm for the dictionaries and eagerly wrote their names inside, knowing the dictionary will become a life-long cherished item. Students were amazed at how much information the petite dictionary can hold, not just the meaning of words, but also a copy of the Declaration of Independence, numerous maps, weights and measurements, list of significant moments in US history, and more. The students also seemed quite eager to bring the dictionaries home so they could 'test' their parents and siblings. 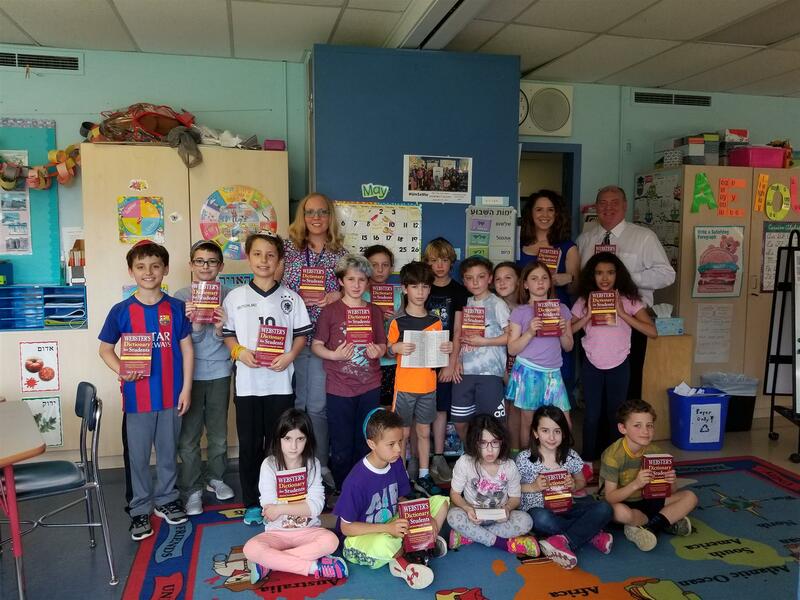 Pictured left to right in the front row are students Nataff, Eli, and Yadid, teacher Mrs. Emily Abrams, students Avi, Natalya, Shai, Gabe, Joel, Gabrielle, Rotarian Jessica Halprin, Rotary Club President Tony Anastasio, students Zoe and Grace. Pictured in the second row are students Miri, Miller, Hadas, Achinoam, and Uri.